Location: Waid Park Recreational area, Rocky Mount, VA. USATF Certified 0.95 mile loop. 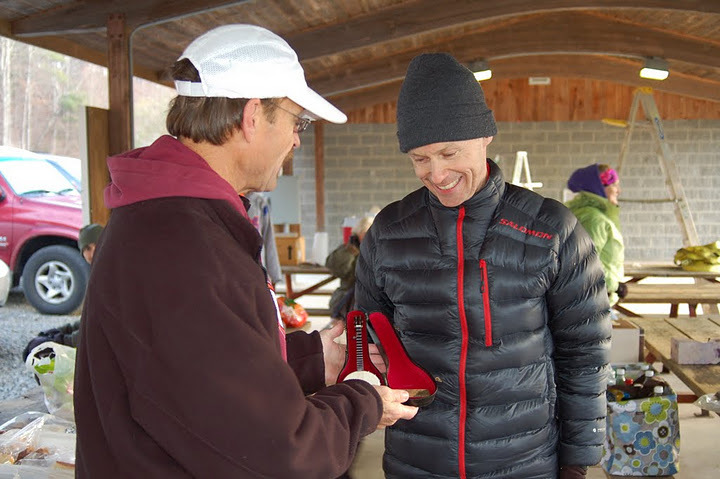 Event: A 24 hour foot race. Entrant limit of 100. Funds: After event costs are covered, extra money goes to support the Franklin Country High School Cross Country Team. Since this was the first USATF certified 24 hour event Many of us running set STATE RECORDS!!! Visit the Virginia State Records website... you'll see I am the record holder in my age group too!!! Along with many other runners from this date! I didn't have a clear goal, but knew I wanted to match what I did at Hinson in September. My first 24 hour event. Read my blog HERE to get that story. I knew I wasn't as confident about my preparation for this event as I was for Hinson. I wanted to go 50k and then see what I was capable of afterward. I ended up with 55 miles there. 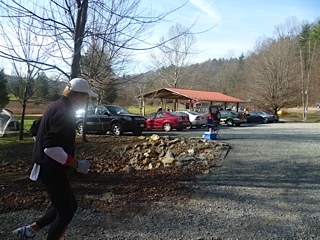 this event was further challenged by the cold weather. I knew it had the potential to hold me back, so I didn't get too set on a certain distance. I ended up covering 100k = 62 miles. Lydia did a total of 50k. It's not like any "normal" race. There is no planned measured distance. Each participant has their own goal. There are more smiles and conversation than at other races, as you keep seeing the same people over and over. The volunteers that count your laps often call you BY NAME, which makes you feel like a celebrity. There is plenty of food and drink awaiting you every lap, and they serve you meals too. 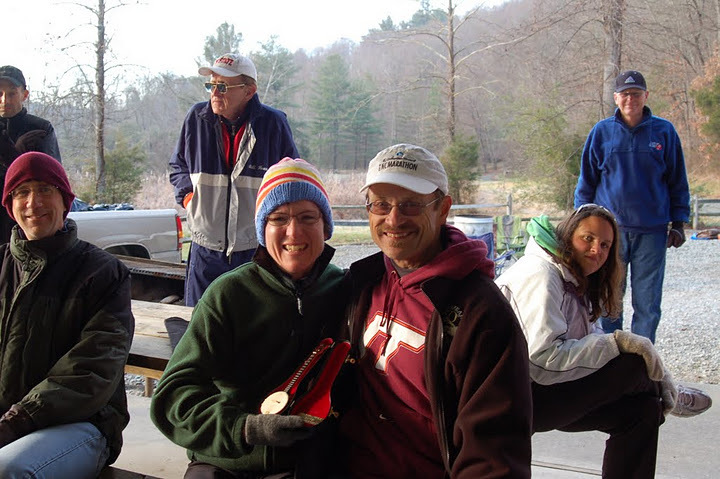 The encouragement you get from volunteers and other participants is unlike any other. 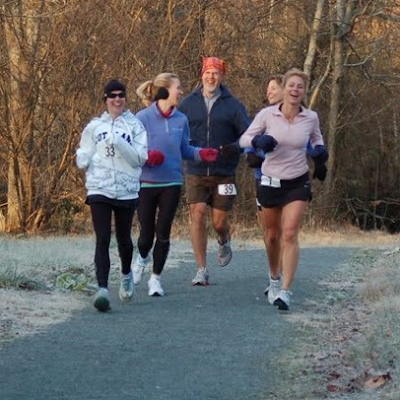 You find many walkers, and the majority develop a walk / run alternating rhythm. Either run a number of laps, and then walk a number. Or approach each lap with a walk / run pattern over intervals of minutes, or as I do over sections of the course. 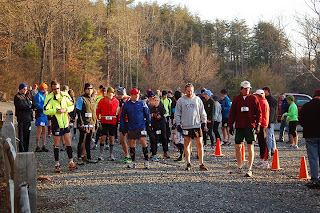 Some participants are there to complete their first 10k, some their first 10 miles, and other was to see what they are simply capable of. Some are family members or friends getting in laps while helping crew for a more serious runner. Everyone has a different agenda, they are as diverse as the runners themselves. 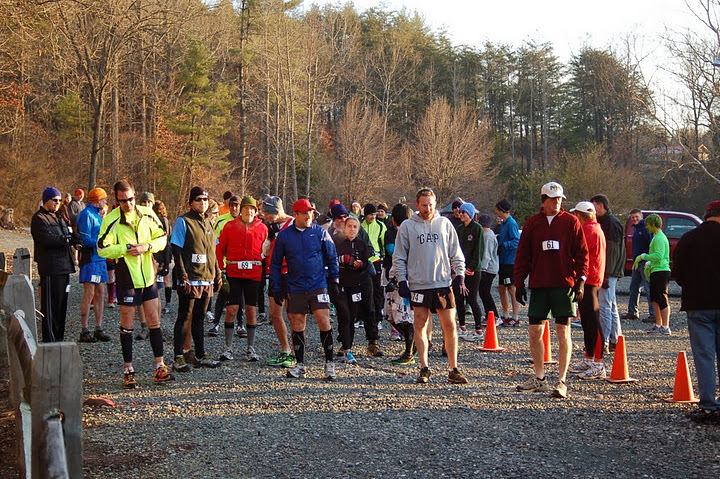 I stressed so much prior to Hinson Lake 24, I think I stressed enough for both that event, and this one! Of course, I stressed on this one, but it wasn't the same. For Hinson I was much worried about the logistics of the event. Where and how I'd set up my personal "camp" and sitting area. If it would be in a convenient location related to the lap start / aid station area and my car. Would the loop I would be running seem too short, or too long? Who would I share my time with there, and how would running this entire event alone effect my later miles? Those were similar thoughts. but for the Crooked Road 24, I had none of those concerns. I was most occupied with when I'd get to run vs. when my wife was running, and who had the kids when and how the kids were going to be provided for. How would the cold effect them etc. I had a goal, of course. it was to run 50k. I'd would have liked to run 50miles if I had the opportunity. 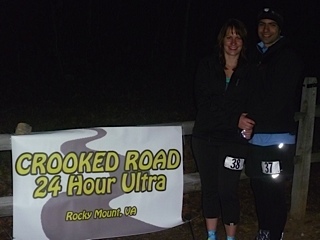 I wasn't confident that I'd be running through the night, it was all weather dependent. I had no idea i would reach 100k, but I knew I was capable of it. I think I was capable of it at Hinson, too, if I had spent more time on my feet. 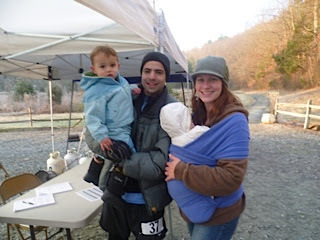 My primary goal outside of me covering 50k in a decent time, was to allow Lydia to cover her planned distances. I knew the nature of the 24 hour event and how it would allow her to reach some pretty cool goals. We decided it would be good for her to run 3 2-hour sections of time. where she would be able to go 8 miles each 2 hour section she ran, bringing her really close to a marathon. Then with an extra lap here and there, she would hit the marathon. Things changed. Our 2yo Pauly had a sleep over at Auntie Ruth's house and he had a lot of fun play time with his 4yo cousin, Nasir. This meant that we packed the car with us two and our 4 month old, Josie. I didn't plan the best with the directions, and figured I could do it like we used to 10 yrs ago, and just write them down. Well, that worked out like it used to. Still needed to stop and ask directions, to find I missed a turn, but we still arrived with plenty of time. 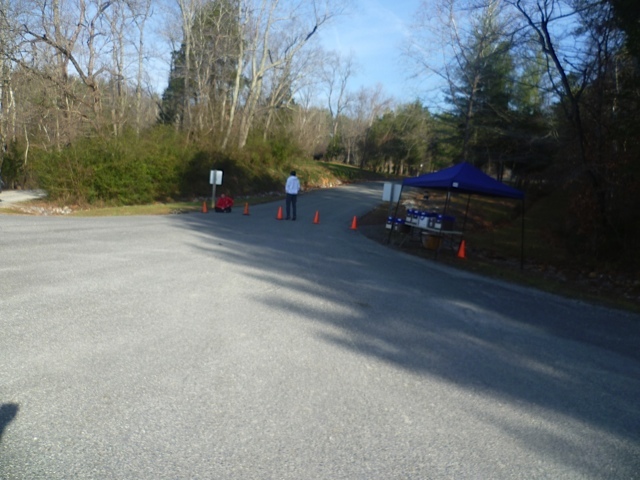 Arriving at the gate to the park were volunteers to hand you your race packet right at your car, and direct you to the parking lot you were assigned to. Packet pick up at the gate. It is true, that you want to go where everybody knows your name. It sure is nice to pull up to a race and see a familiar face. Ricky Scott one of the main Race Directors (as it was put on by the Crooked Road Running Club) was there handing me and Lydia out packets at our car, and ushering us to the assigned lot. I was excited to soon see Sarah Holbrook, Anita Finkle, Graham Zollman, all from the Roanoke area and Mountain Junkie events! Fellow Crooked Roaders Johnny Nolan, Pam and Tom Rickard were also other smiling faces, I was happy to see. Also Annette Bednosky was there, and I was glad to have a quick chance to meet her before the event began. She is a well accomplished runner currently recovering from an injury due to a car accident that has set back her running. Unpack and get ready to run! We unpack and complete dressing according to the weather. I brought the tent and began to set it up, but really just spread it out on the grass, so I could tend to it later. 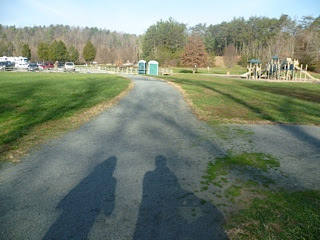 It was arranged that Lydia would run for the first 2 hours, as I spent time with Josie, and then we would switch. Her goal in 2 hours was 8 miles. ...and with a very anti-climactic "GO!" (which made Lydia laugh at it's simplicity) we were off! 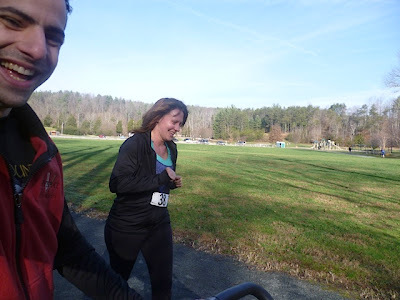 We waked our first lap together to feel out the weather, and our attire, and well, just cause there was absolutely no reason to be rushed at all! 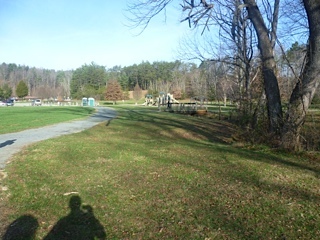 The course wiggles around the park, maintaining at least a 2 person wide path at all times. 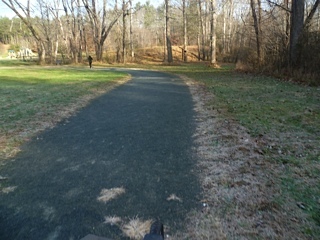 Alternating from cinders (most of the path) some paved areas, and a gravel road for a short part of it. Each lap started at the table where the volunteers were to count your laps. progressed to the only hill on course, which was more significant that Hinson, and though very runnable it was walked by most without question. The downhill on the backside of the hill, I thought was much worse than the up hill. Especially once my knees became weaker through the miles. It then encountered the "far side" of the large parking lot. Then looping around that lot, past a playground and crossing the road which we all drove in on, where the volunteers awaited the late comers and monitored traffic for runner safety. then the short gravel road back to the start and aid station where you cross through the smaller lot (and small pavilion). There is also another playground here and plenty of space to set up camp / tents etc. Lydia completed her first 8 miles and took Josie, then I began to run. About 2 and a half hours had elapsed by now. I was well loosened up for walking around, and showing off the baby. The excitement level was up high and all who I spoke with asked why I wasn't running but soon understood. Lydia kept walking. Ruth soon arrived with Pauly my 2yo and her son Nasir. They hung out at the playground most of the time and Ruth took Josie, who slept like a champ in the warming weather and comfort of the running stroller. 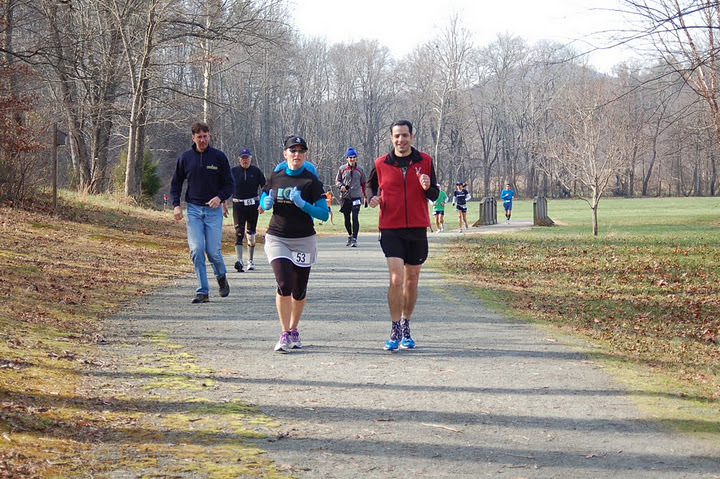 I was surprised to see that Lydia was out running again. This wasn't the plan. She was supposed to have 3 2-hour sessions, spaced out, but she really hadn't stopped moving since her first 2 hour session. We are so thankful for Ruth to have entertained Pauly the evening before, and to watch him during the day allowing Lydia and myself to run. I only stayed a couple laps ahead of Lydia as she was making her own laps too. Soon enough it was time for her to begin her second 2 hour block of running. Ruth still had all the children, and Lydia was feeling good, so she continued on. I was approaching 31 and Lydia was approaching 26 soon after! We arranged for Ruth to head home, and Lydia was going to finish a couple laps and be behind her about an hour. sure enough, Lydia and I timed our laps to that I hit 31miles (50k) and she hit 26.2 (marathon) upon completion of the same lap, an sure enough - Lydia had finished her first marathon!!! With Lydia having had hit a marathon + and headed home, I knew she would arrive in the AM fresh and able to take a couple more laps, making her total mileage for the 24 hour event a 50k, and that became my goal for her. She didn't refuse! Lydia and I just at dark, having completed our initial distance goals. At that point on, thought it was late, and darkness had arrived. The evening was still early, but I was left unattended with only one goal left... RUN. I kept telling myself, I had all ready covered more than 50k, but I wanted to run. I decided to take the night in 6 and 8 loop segments, and alternating between either 6 loops or 8 loops. on each segment of 6, I would run 2 and walk one. then run 2 and walk one. total would be six for that set. for my sets of 8 I would run 2 walk 1 and run another then repeat, which made me run 3 in a row in the middle of the set of 8. Methods like that I believe is part of what allow you to endure the distance, the run and walk pattern, but I also think the for myself setting up a set, an assignment perhaps, gives me a task to complete. and it takes a lot of mileage, and breaks it down into smaller bites, that I can sort of check off as the miles pass, and the hours pass too. It wasn't long before I hit 50 and though I knew that was another goal of mine. I knew I wanted more, so when I hit it I didn't feel that I'd "earned" a break at all I kept pushing through. When I did take breaks in between sets of 6 and 8 laps at a time, I tried to limit them to 15 or 20 mins at most. use that time to really hydrate and eat some. More than I would be in between each lap. As I often made sure I grabbed something from the aid station on each pass. 4:00 came early and I got a text message from Lydia that she was up and would be on her way soon. I started calculating how many miles I needed to do to get to 100k, and what time Lydia would arrive. I had to hustle. My plans for the sets of 6 and 8 just went out the window and I kept a run walk pattern, alternating through parts of the lap - and kept pressing on. I think that during the hours of 4 to 5 and maybe 5:30, I ran the hardest that I did for the entire event, and yet after all those miles too! 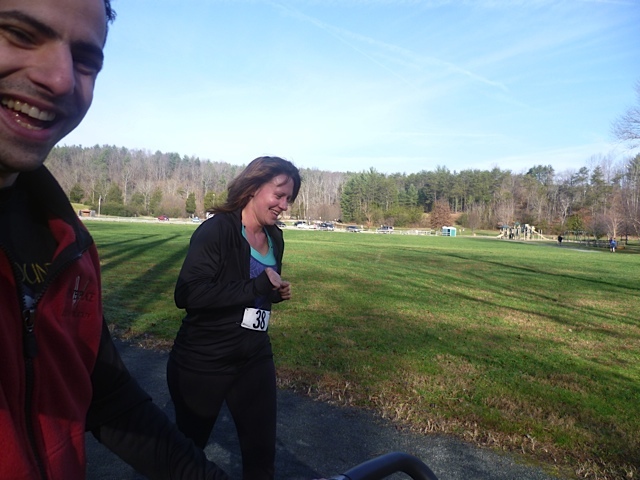 I really wanted Lydia to complete a 50k for the 24 hours, and I knew that to do so , I wouldn't be able to run once she arrived and an hour and a half would be minimal for her to complete it, yet it all depended on how well she felt and how fast she could get there. I knew she would have both kids with her. I knew I'd have to stop running once she arrived. I had always told myself that for this event, her goal would be more important than mine... but with being so close to 100k, I just HAD to get there. Lydia suggested that she arrive and cover a few laps then we do our last lap together with the kids completing her 50k, and my 100k... and that is exactly what we did! Lydia got there and I covered 2 more laps, hustling to go as fast as I possibly could. 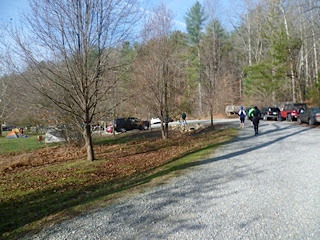 The problem began here, in that I essentially stopped eating and drinking at the aid station. I should have known better. This is where having someone crew for you really comes into play. They would have made me drink at least. and I didn't think about it until after the 4th pass or so of the aid station. It hit me that I wasn't drinking. I don't think this had any real tangible negative effect, but once I realized it, I got concerned. I had gained focus on the task, but lost focus in other areas. I'd say that is expected when you've been up all night and running distances and times that you've never done before. 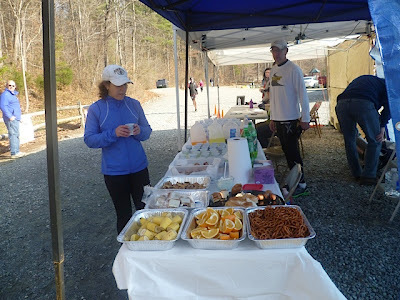 With all that serious aid station support, you wonder why anyone would pass it up! Lydia got to running and I stayed in the warm car with the kids. I felt that we had plenty of time. Lydia covered 4 of her 5 laps and we had 30 mins left. 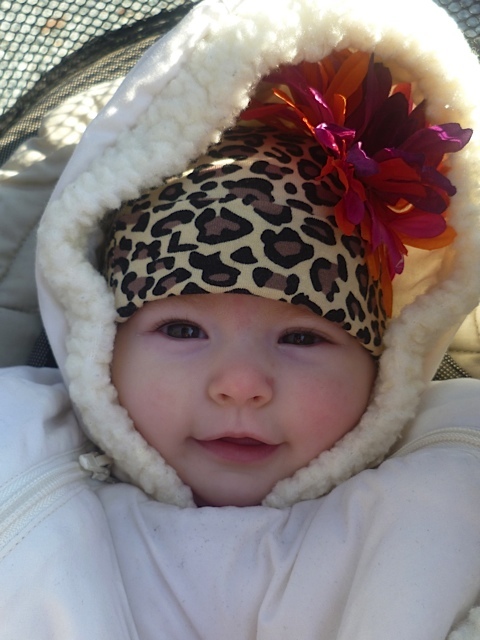 We got the kids all bundled up and walked a final lap with them in our arms. it was sweet, but goodness my arms were barely able to carry my 25lb 2yo for a while mile! funny how it's my arms that were weak, when you'd think it should be my legs? While my legs were demanding all the nutrients my body could offer, when I asked my arms to pitch in for a while, they weren't ready at all. After 100k and 50k, the Victory lap with the kids! At Hinson it's called the banana lap. but at the Crooked Road they give you a popsicle stick and it has your number on it. You head out on the last lap and when the car alarm (horn) sounds across the park you drop your stick along the path and they then measure your final distance from the start. Soon after we all gathered around for some post-event announcements and awards. Winners were announced, you can get to the results and some links to pics at the CR24 Results page. 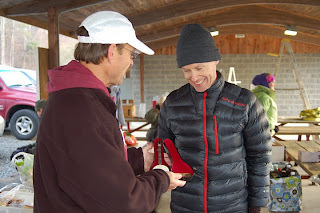 Some who remained in attendance got a free pair of Injinji toe socks. Lydia and myself got a pair, and we were glad to have! I have run in them before, but I prefer them after long runs, they feel good on my toes, when I've run so much that my toes are sore. I should try to run in them again for the second half of a long run, to minimize toe rubbing blisters. which is one of my main tangible injuries from this event. During announcements I had though on a couple occasions that I came in the top 10 of men overall, but I was wrong, cause once the results were posted, I was 19th over all and 13th for men. with 62.72 total miles. Lydia was about 16th for women. When at one time we had thought we both were in top 10. but that was just the way they were doing results at the end of the event, based on who was still in attendance. The most obvious is the distance covered. This was also an event, that not only did I complete with Lydia, but we shared the event together. Another reason to like 24 hour events! I didn't consume and NUUN, or GU. I did drink Ensure as the most different thing I did. 2 during the event. I was concerned how the dairy-like substance would settle on my stomach. but I drank one before a walk lap. and I drank another during a walk/run lap while I was on my walk portions, and I took the full lap to drink it. Otherwise nothing really different. I washed my feet at 2 times through the 24 hours. I switched shoes after 50 miles. Switched socks one time in the middle of the 50. I was running with Patagonia running tights. that was new for me, this is my first event with them. I've only used thin polyester first layer items on my legs before in the cold, but this is my first pair of running pant / tights, They worked just fine and didn't cause any problems. I did sleep for one hour in a chair at the fire, but otherwise I stayed busy all night, taking rest breaks, but never fully stopping except for that nap and then I was back on the trail. This picture really captures the fun that was had on that day. This is an interesting one. Immediately after, once things slowed down and I was back in the car, Lydia driving me home. Nausea set it. We even had to stop somewhere to hit the bathroom, but no real production of the feelings I was having. I knew I had pushed myself too far, but didn't feel nauseous during the last 30 mins we were there, through the results etc. they did have pancakes for breakfast and I was enjoying them with no problem. Perhaps it was the car ride? that is my only guess. I've never had much nausea from running, I just don't push myself THAT hard, so I'm unsure how it feel to my body, but it could sure be related. as I was quite exhausted and I knew I slept most of the way home. Thankfully What ached on my body was not chafing, not knee pain, and not even muscle pain. but I suffered one blister on my pinky toe, and my ankles felt over worked and sore. 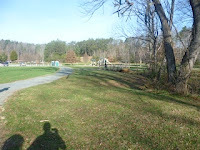 This concludes my awesome 2011 running year! As of now, my ultra running adventures are lining up, with all but a signed application to the Lynchburg Ultra Series. which includes 3 50k events, and one 50 miler. 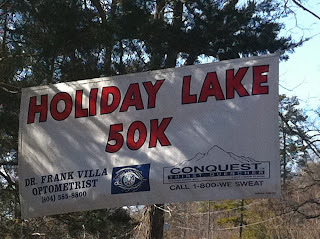 That begins with Holiday Lake 50k++ in February, which I am all ready signed up for. 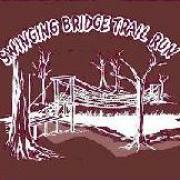 but prior to that I've got the Frozen Toe 10k and then the Swinging Bridge 50k in January as well. Look out! Cause here I come!